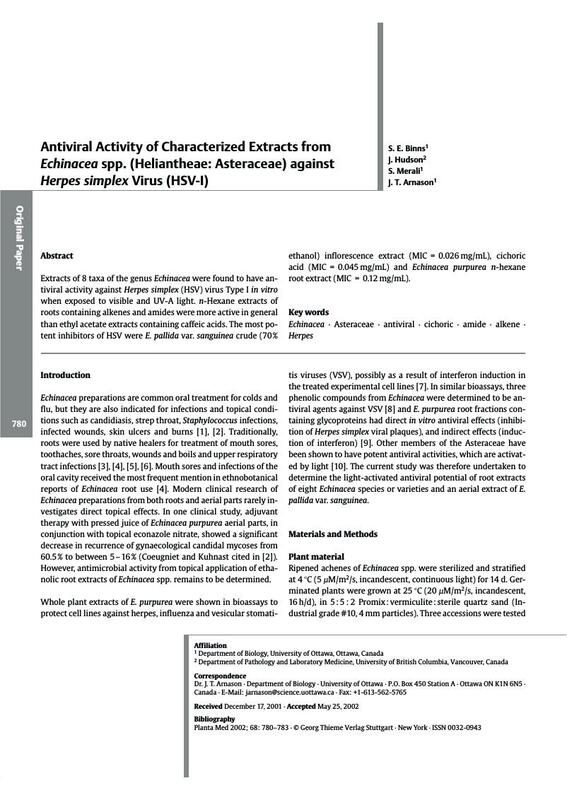 Extracts of 8 taxa of the genus Echinacea were found to have antiviral activity against Herpes simplex (HSV) virus Type I in vitro when exposed to visible and UV-A light. n-Hexane extracts of roots containing alkenes and amides were more active in general than ethyl acetate extracts containing caffeic acids. The most potent inhibitors of HSV were E. pallida var. sanguinea crude (70 % ethanol) inflorescence extract (MIC = 0.026 mg/mL), cichoric acid (MIC = 0.045 mg/mL) and Echinacea purpurea n-hexane root extract (MIC = 0.12 mg/mL).